Coconuts are one of the world’s healthiest foods and are considered a delicacy in many parts of the world. They provide not just food and water, but are highly nutritious with essential vitamins and minerals. There are many different ways to enjoy them. Coconut meat or flesh can be eaten fresh or dried. In its dried form it is called copra. Whether dried or fresh, the meat is used in anything from desserts and confectionery dishes to baked goods and savory dishes. Coconut oil is extracted from the copra. 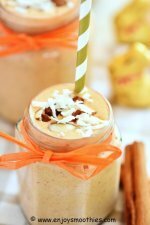 Coconut milk is the liquid that is extracted from the grated meat of the coconut and I love to use it in smoothies. 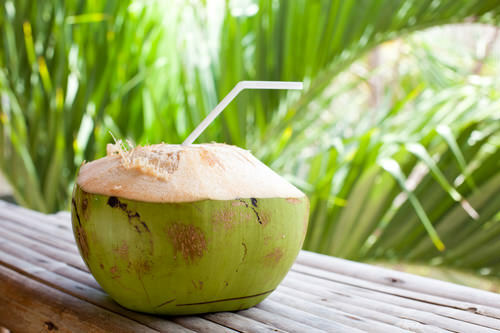 Coconut water is the clear liquid found inside young coconuts. 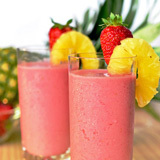 It is less dense and contains less fat than coconut milk and is a great replacement for water. It is the young coconut that is the most revered, both for its health-giving properties as well as its meat and water. Older ones contain less water (if any) and the meat is hard and dry. But fresh, young coconuts can be difficult to obtain and even if you do find them, the next problem is getting them open. Unless you know what you’re doing, opening up a coconut can be tricky and downright dangerous. Which is why most of us resort to buying the ready-made products. Not everyone has the time or inclination to make their own coconut milk and there are many good commercial brands available. However, as with all things, they are not all the same. Should you buy your coconut milk in a box or a can? Cans of coconut milk are readily available, particularly in Asian grocery stores. They are thicker and richer than the boxed varieties. However, some brands include preservatives, emulsifiers or stabilizers. Recommended brands are Trader Joe’s Light Coconut Milk, Native Forest Organic and Natural Value Lite Coconut Milk. All of these cans are BPA-free. BPA is a chemical known as Bisphenol A and is found in plastics and food packaging such as canned goods. It has been linked to heart disease, diabetes, breast and prostate cancers and reproductive abnormalities. If you wish to minimise your exposure to BPA choose foods that are packaged in glass or cardboard containers. Which brings us to coconut milk boxed in cartons. Boxed coconut milk is made to mimic cow’s milk so is usually fortified with calcium and vitamins. 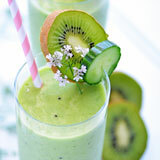 The flavour may not be as rich as some canned coconut milks, but this can be a bonus when making smoothies as the flavour won’t overpower the other ingredients. Brands recommended are Silk Unsweetened Coconut Milk and So Delicious Unsweetened. Cut the peach into pieces and remove the stone. There is no need to peel the peach. The skin will give you added fiber. Hull the strawberries. 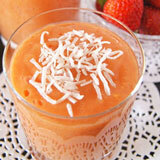 Place the peach pieces, strawberries, banana and coconut milk into a blender and blitz it all together until smooth. 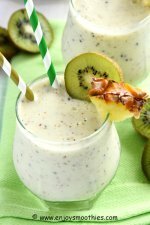 Place the peaches, banana, yogurt, coconut yogurt, coconut milk, maple syrup and maca powder into the jug of a blender then blend until smooth. 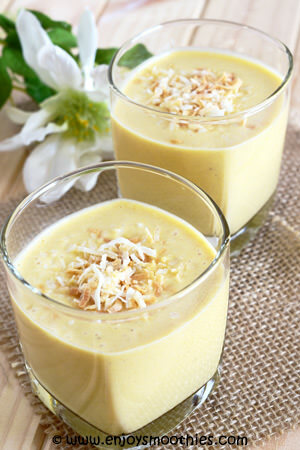 Pour into two glasses then sprinkle over the toasted coconut. 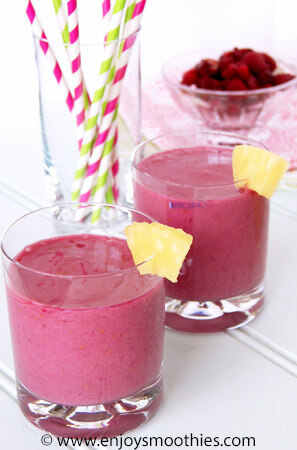 Place the frozen raspberries, banana, sliced pineapple and coconut milk into a blender and blitz on high until the ingredients become thick and creamy. 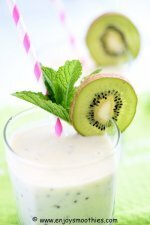 Place blueberries, milk, yogurt and nutmeg into a blender and mix until all ingredients are combined and the smoothie becomes creamy. 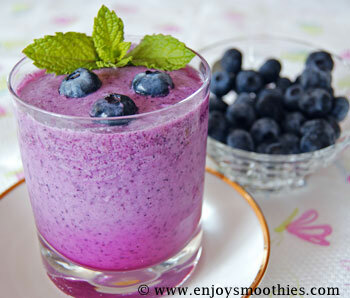 If you are using fresh blueberries you may need to add ice to get that characteristic chill and velvety smoothness. 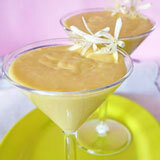 Add frozen banana and mango chunks to your blender. Add enough coconut milk to achieve a thick but pourable consistency. I found I needed about one and a half cups. 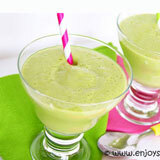 Add the juice of one lime then turn your blender on and process until all the frozen fruit is smooth and creamy. 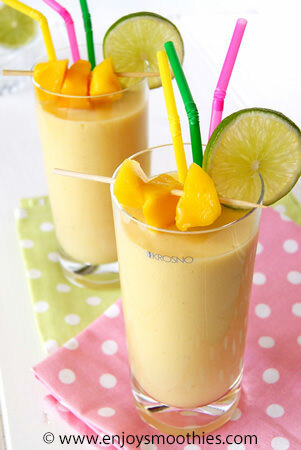 Add the mango chunks, mandarin pieces, banana, coconut yogurt and coconut milk to your blender. 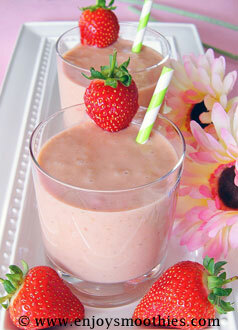 Blend on high speed for about a minute or until smooth and creamy. 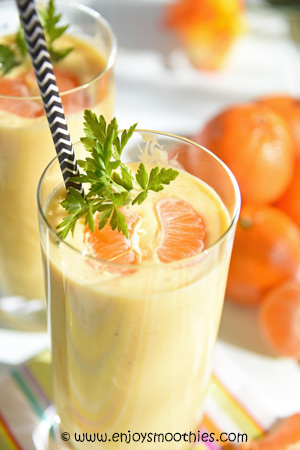 Pour into two tall glasses and decorate with mandarin segments. Enjoy. One of my favorite combinations. Tastes just like a jaffa smoothie.